Recently renewed talks between India and Pakistan may not go anywhere, but they are a welcome shift in the relationship. The trajectory of ties between the neighbors over the past two decades does not invite optimism about the latest round of talks. It’s hard to figure out why the talks were suspended in the first place, and what has changed since that merits renewing the dialogue. Six months ago, when New Delhi unilaterally decided to cancel secretary-level talks, it justified the decision by denouncing Islamabad’s dalliance with Kashmiri separatists. Pakistan has not made any assurances that it won’t parley with Kashmiri insurgents in the future. “There is a realization in both the countries that talks should continue despite having differences and despite having doubts about each others’ political interests,” says Zakir Husain of the Indian Council of World Affairs, a New Delhi-based think tank. 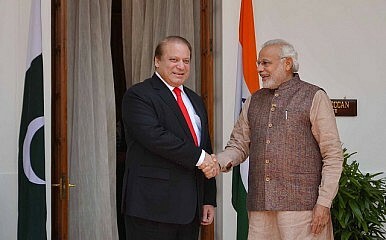 Husain argues that the prospective talks should be viewed in the context of India’s “neighbor-first policy that was initiated by Prime Minister Narendra Modi after assuming office in May last year.” “New Delhi has made significant progress in engaging other neighbors; it was only with Pakistan [that] no substantial progress has been made in the last eight months,” he adds. Husain further adds that by reaching out to Islamabad, India is trying to strengthen the SAARC. Some analysts see a change in context that warrants the resumption of the stalled dialogue. The Times of India’s editorial page points out that America’s attitude toward Pakistan has changed, with more U.S. lawmakers seeking Islamabad’s compliance on counterterrorism. Pakistan’s military establishment in Rawalpindi is showing a great amount of sincerity in that effort. Washington may have additionally pressed New Delhi to begin the peace process. Modi’s call to Sharif takes place just weeks after Barack Obama’s visit to India. Modi also faces political pressure back at home to fast-track talks. In the Jammu and Kashmir region, the People’s Democratic Party (PDP), a regional bloc that strongly favors talks with Pakistan, is about to clinch a deal to form a coalition government with Modi’s Bharatiya Janata Party (BJP). The BJP, which would become a ruling party in the region for the first time if the alliance materializes, does not want to hurt its ally, the largest party in Jammu and Kashmir after recent elections. But can Pakistan see through that guise? Cricket diplomacy has been tried, but has quickly faltered. The countries still remain prisoners of the past and deeply-held prejudices. “Without addressing substantial issues, like persistent clashes at the border and [the] killing of innocent civilians… no talks will succeed,” says Sib Kaifee, a veteran journalist based in Islamabad. Kaifee feels that holding “talks for the sake of talks is a waste of time.” “Today Islamabad is in a different mindset. It does not see New Delhi as an existential threat. It is struggling with its own internal threat. Pakistan is willing to compromise… but New Delhi needs to take a sincere step,” he further notes. Kaffee’s skepticism is shared by many on both sides of the border. No one expects a miracle when India’s foreign secretary, Subrahmanyam Jaishankar, visits Islamabad next month. The distrust and the chasm between the two nations are too wide to fill in one trip. Only continuous engagement can set India and Pakistan on the road to peace. Another breakdown in talks might suit the political interests of the ruling establishments in Delhi and Islamabad, but it hurts almost everyone else. The political vacuum is filled by non-state actors and terrorist groups, which further distort and radicalize society as a whole. Every setback in talks strengthens India and Pakistan’s deep-seated distrust and animosity. Stronger engagement not only provides economic stimulus to both countries, it also helps stabilize the region. Stability in Afghanistan is very much dependent on the camaraderie between New Delhi and Islamabad. The whole region stands to benefit if peace can be upheld across the Radcliffe Line. Dialogue is not a favor bestowed from one country to another. It is a necessity for all. In that vein, the resumption of talks is welcome, even if they have little hope for success. Once again, specific issues in the India-Pakistan relationship have derailed general peace talks.